This can affect anyone, particularly people who take poor care when trimming toenails. When you first have an ingrown toenail, it may be hard, swollen and tender. Later, it may get red and infected, and feel very sore. Ingrown toenails are a common, painful condition, particularly among teenagers. Any of your toenails can become ingrown, but the problem more often affects the big toe. An ingrown nail occurs when the skin on one or both sides of a nail grows over the edges of the nail, or when the nail itself grows into the skin. Redness, pain and swelling at the corner of the nail may result and infection may soon follow. Sometimes a small amount of pus can be seen draining from the area. Ingrown nails may develop for many reasons. Some cases are congenital - the nail is just too large for the toe. Trauma, such as stubbing the toe or having the toe stepped on, may also cause an ingrown nail. However, the most common cause is tight shoe wear or improper grooming and trimming of the nail. Ingrown toenails are readily evidence from inspection and require no diagnositc imaging. Your Consultant will confirm the condition upon examination. If there is no improvement in 2-3 days, or if the condition worsens, it is advised to see a Consultant. As an interim measure before surgery, you may need to gently lift the edge of the ingrown toenail from its embedded position and insert some cotton or waxed dental floss between the nail and your skin. Change this packing every day. If excessive inflammation, swelling, pain and discharge are present, the toenail is probably infected and should be treated by a Consultant. You may need to take oral antibiotics and the nail may need to be partially or completely removed (depicted below). Your Consultant can surgically remove a portion of the nail, a portion of the underlying nail bed, some of the adjacent soft tissues and even a part of the growth centre. Surgery is effective in eliminating the nail edge from growing inward and cutting into the fleshy folds as the toenail grows forward. Permanent removal of the nail may be advised for children with chronic, recurrent infected ingrown toenails. 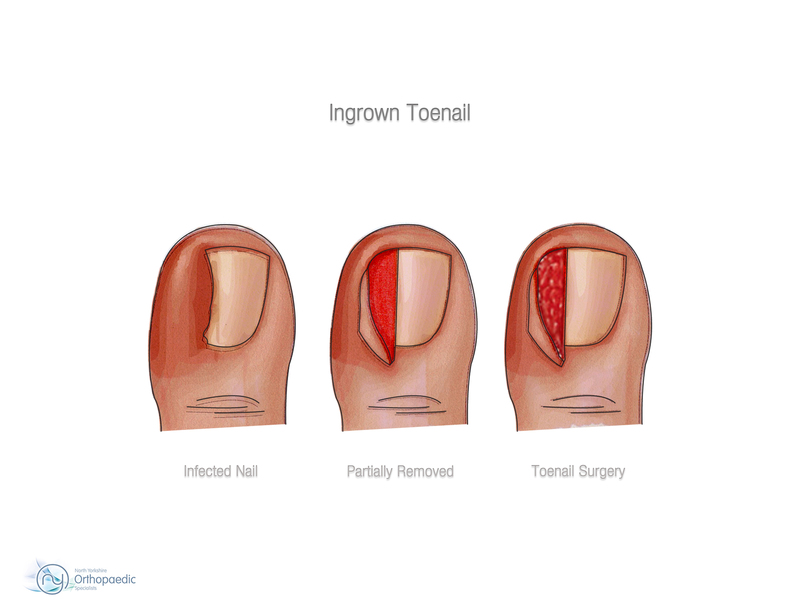 If you are in a lot of pain and/or the infection keeps coming back, your Consultant may remove part of your ingrown toenail (partial nail avulsion). Your toe is injected with an anesthetic and your Consultant uses scissors to cut away the ingrown part of the toenail, taking care not to disturb the nail bed. An exposed nail bed may be very painful. 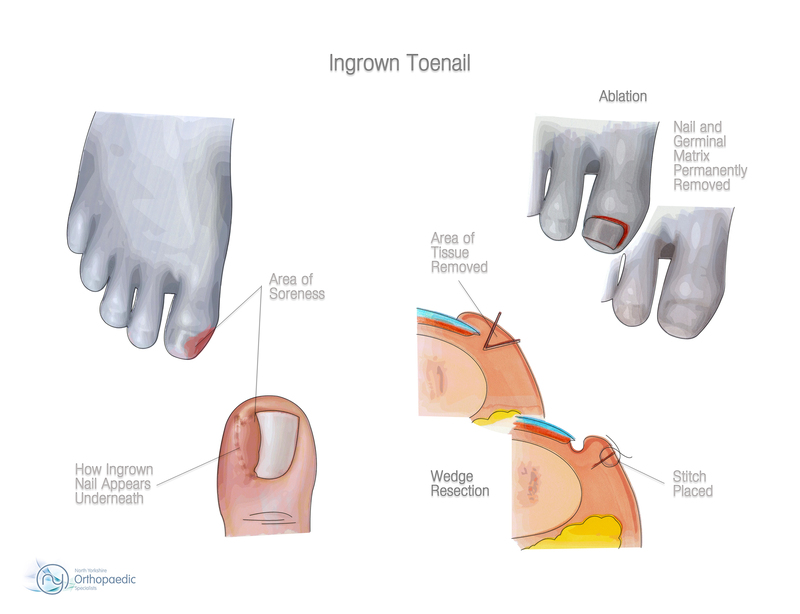 Removing your whole ingrown toenail (complete nail plate avulsion) increases the likelihood your toenail will come back deformed. It may take 3-4 months for your nail to regrow. After the procedure, your toe will be wrapped in a large sterile bandage. This will help stem any bleeding and prevent infection. You should rest your foot and keep it raised for 1-2 days after the operation. After the anaesthetic has worn off, your toe may be sore and tender. In order to reduce any pain, you may need to take a painkiller, such as paracetamol, and wear soft shoes or open-toed sandals for the first few days following surgery. You can remove the bandage 2 days after having nail surgery. Soaking your toes with salt water will help the area heal. These procedure has a very low complication rate. A thorough examination of your foot and general health is important so that general complications can be minimised.